Dual Voltage / Built-in Power Supply The system provides 4 amps of 12 or 24 volts DC to power low-voltage locking mechanisms. 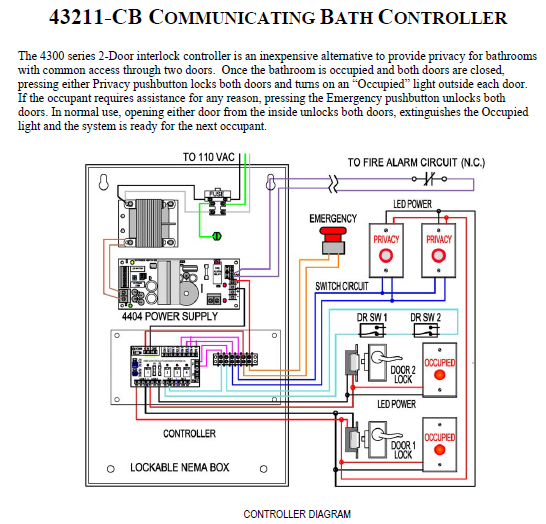 Versatile Control The communicating bathroom system is designed to operate virtually any low-voltage fail-safe electric lock. Maglocks can be used as well with push buttons at each door to allow the user to exit. Mechanical Egress Electric strikes offer a simple mechanical means of exiting the bathroom when used with standard manual locksets having the �storeroom� function. Unimpeded egress is possible at any time. 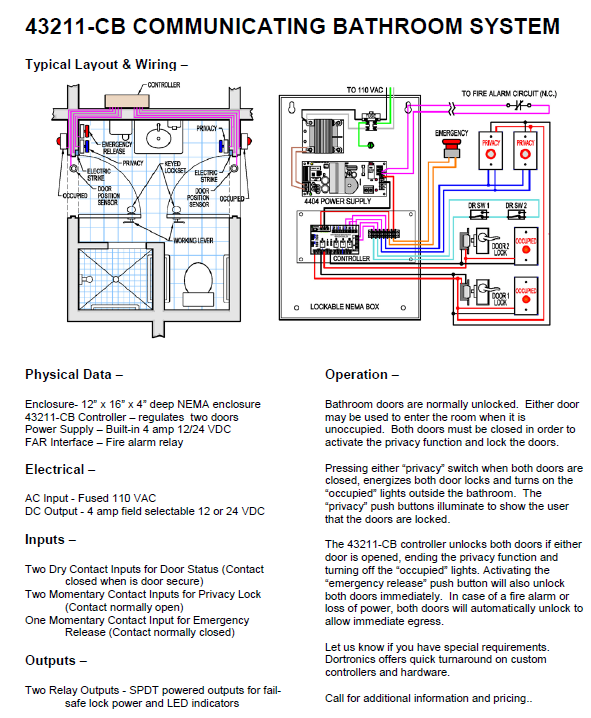 Emergency access to the bathroom by key is also possible when using manual locksets. A latch bolt monitor switch can be used to signal the controller to unlock both doors when either lockset handle is operated. Visual Status Indicators Hi-Intensity LEDs indicate when the bathroom is occupied. The interior �privacy� push buttons are also illuminated to show that the privacy function has been activated and that the doors are locked. Fire Alarm Interface The power supply includes a fire alarm interface that cuts power to the locks for immediate egress during an emergency. This redundancy provides an extra level of safety to assure free egress in all conditions. Please note: this a complete system. Each system includes the following: one 2 door controller including power supply to power complete system, 2 1200 pound mad locks, 1 heavy duty bi color LED push for privacy button, 1 hi intensity red LED and 1 emergency inside release button. Electric strikes sometimes are used instead of mag locks and of course we sell those. Please give us a call before you order if you want to modify the system using other components.